Among the thousand genera of available fungi, only a handful of them can be cultivated as edible mushrooms. But before that, let us first learn wha mushrooms actually are? In simplistic terms, mushrooms are multi-cellular fungi. For a biologist, they actually are soft, fleshy extension of hyphae or mycelia appearing above the ground. Among the living organisms, they are classified into separate kingdom of fungi, distinct from plants and animals. 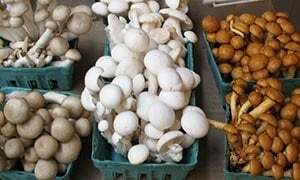 Mushrooms lack in chlorophyll, and therefore, cannot synthesize their own food, which forces them to survive on readymade organic matter for growth. Mushrooms come in many different shapes and appearances. In general, they feature a cap and a stalk; and frequently discovered on organic manure, wood, humus, or any rotting matter. Lack of chlorophyll pigment makes them appear in colors other than green, usually in white, brown, brown, and dark (truffles). Among thousands of mushroom varieties, only a few hundred can be worth exploring for consumption safely. In general, an edible mushroom can be domestic or wild. Domestic mushrooms are the ones grown under supervised farming, and marketed through authentic retailers. Wild mushrooms generally found in the forests and fields. They, in general, are foraged in the wild, and may be limited for self use or for sharing among friends, and relatives. Edible fungi occur in two major taxonomic groups. The ascomycetes include truffles and morels. Mushrooms endowed with natural proteins, ample amount of vitamins, minerals, and antioxidants. They contain vitamin B-12 in sufficient quantities which otherwise lacking in any plant produces. Despite of their high quality nutritional composition, they relatively low in calories, and fats and contain zero cholesterol. Additionally, mushrooms carry natural anti-oxidants such as ergothinene, phenolic pigments etc. They indeed are excellent sources of essential minerals like manganese, selenium, zinc, copper, iodine, and molybdenum. Furthermore, mushrooms are modest sources of vitamin-D (ergo-calciferol). Vitamin D plays a vital role in the calcium and phosphate metabolism. While wild mushroom collection is specialist's job, cultivated mushrooms can be picked up by anyone and can be easily available for most of the season in the grocery stores. Choose fresh looking, firm ones. Avoid dry, discolored, shriveled mushroom as they indicate signs of decaying and hence, out of flavor. In the supermarkets, they generally available in polythene sheeted packs, canned, etc. Mushrooms are highly perishable. Handle them with care. Once at home, use them as early as possible. If at all to be stored for later use, do not unseal the pack and keep as it is inside the refrigerator set at 0-2 degrees. Keep unpacked, loose mushrooms inside a paper pack to absorb moisture and place inside the refrigerator for short term use. Mushrooms can be dried, and kept up to one year. How to use edible mushrooms? Clean mushrooms that intended to be used in cooking. To clean, just brush them using a soft cloth or brush to remove tiny peats on their surface. If at all to wash, do so briefly under running water or in slightly vinegary water. Do not allow them soak and damp. Dry by using a soft towel. Do not peel. Trim any dry, tough end of stem. Peeling mushrooms like in vegetables is unnecessary as this involves loss of flavor and nutritional value. It is mainly recommended for aged mushrooms. The stem (or "foot") of the mushroom is usually edible. Some species have a tough and fibrous stem that need to be removed. In other cases, simply cut of the base of the stem if it is dry or has traces of soil. Cook mushrooms in stainless steel, glass, cast iron or terra-cotta pots to avoid their browning. Add salt at the end of cooking to prevent them shrink due to draining out water. To get maximum flavor, it is best to add mushrooms at the end of cooking to dishes that require prolonged simmering. Freezing affects their texture and reduces their flavor. While large numbers of mushrooms are simply inedible, the number of poisonous/lethal mushrooms is relatively small. Many of these gathered mistakenly while foraging for edible wild mushrooms in the forests and fields. There are no consistent features or definitive tests that distinguish edible mushrooms from poisonous varieties. The only reliable guide to edibility is the knowledge that someone has eaten a particular type and survived. An expert having clear knowledge of poisonous mushrooms can identify and distinguish them from edible wild mushrooms. Some of notable poisonous species are Amanita phalloides, which is the major cause of deaths around the world from mushroom consumption. Without being poisonous, several varieties can cause illness, stomach ache and vomiting. Therefore, it is important to know the exact type and edibility of any mushroom before consuming it. (Medical disclaimer). <<-Back to Home page from Edible mushrooms.